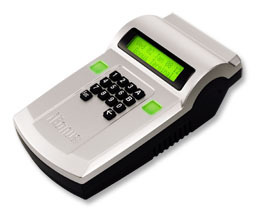 iBonus Terminal is the most powerful and sophisticated off-the-shelf solution available today. Comprehensive member card transaction and smart card handling functions such as issuing card, blacklist and replace card are all included in this little device. It enables the card handling process to be done at any branches.Being off-the-shelf and field proven solution, iBonus System can let you issue smartcards with your own brand in no time. iBonus Terminal is the heart of the loyalty operation. It compactly contains an embedded web server, journal database with built-in software applications that operates independently without the need of an extra PC. Operation is carried out using a keypad for input and a built-in smart card reader to transfer information to and from the Member Card. Transaction records stored in the Terminal can be collected by iBonus Server software through TCP/IP network. New Member Cards are issued by first presenting a Master Card supplied by the factory to assign a Company Code and a range of unique Card ID’s. 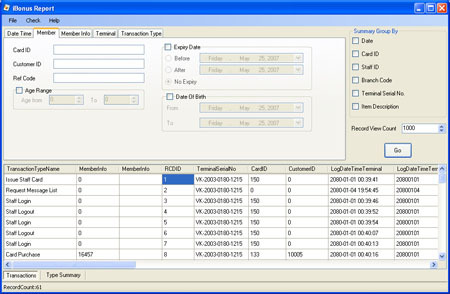 The Company Code is used to identify a particular operator. Member Cards will not be able to operate on Terminals if the Company Code of the Member Card is different from that of the Terminals. Staff Card is basically a conversion of Brand New Card (Newly formatted card) to Staff Card. Staff Card login is required for the Terminal to accept the Member Card operation such as addition and deduction of bonus points. Staff Card logout is recommended when the staff is not attending the Terminal. 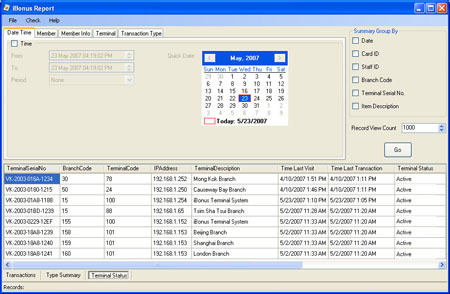 Staff login and logout action are recorded as transaction in the Terminal, and they provide trails for auditing purpose. 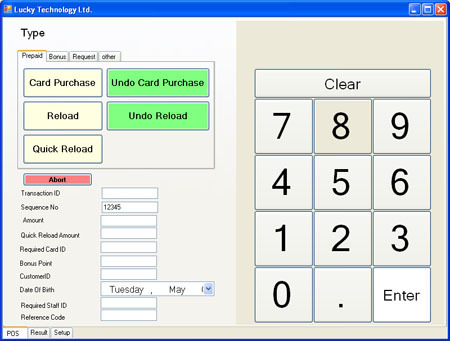 iBonus Terminal provides generic transaction types for performing calculations of stored values, such as, Purchase, Reload, Bonus Point Addition and Redemption. The behavior of all transactions types are consistent with the combinations of card status, system setting and system status, like, decryption keys, expiry settings, decimal mode, bonus rate, blacklist, card sector usage, card value limits. Without the need of redeveloping the sophisticated algorithm behind, any one who are new to smart card systems can make use of them and quickly deploy a loyalty system. After finishing a transaction, such as adding bonus points, redemptions, staff login, the transaction record is stored in the Terminal’s transaction queue. There are 5,000 buffer in the transaction queue. The records in the transaction queue are sent to server as soon as the network connection is ready. The terminal stops accepting transaction when the queue is full. iBonus Terminal provides advanced card handling function which allows card expiry date extension (Card Renew), Lost card replacement and Corrupted card repair at Terminals of any branches. It saves up the establishment of central call center for card control purpose. iBonus Server is bundled for free with iBonus Terminal. 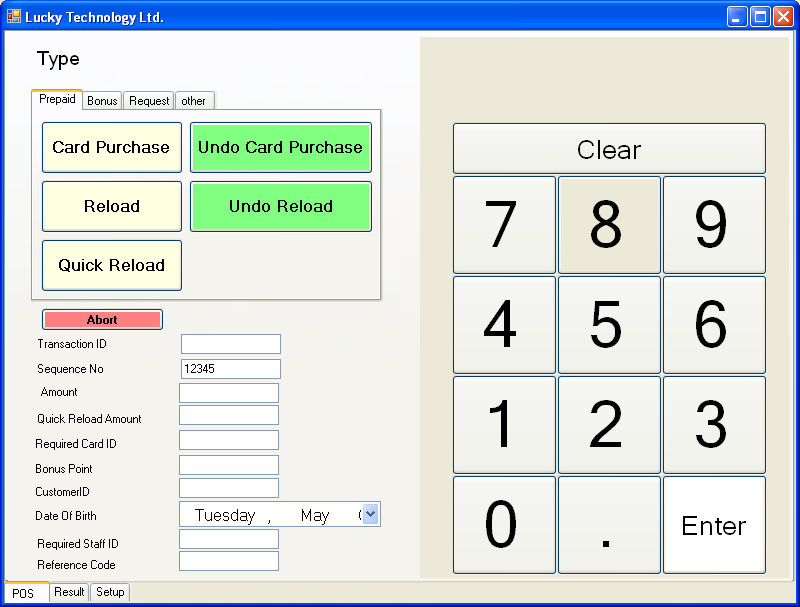 It is a windows based software, which collects transaction records from Terminals and stores them in Microsoft Access or Microsoft SQL Server 2005, and manages the card renew, repair and replace queries from all the Terminals. 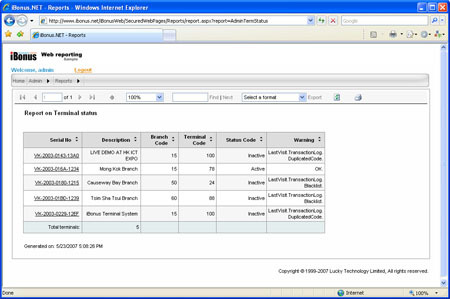 System administrator can conveniently monitor and exports the status of all Terminals thru a real time status report and event log. 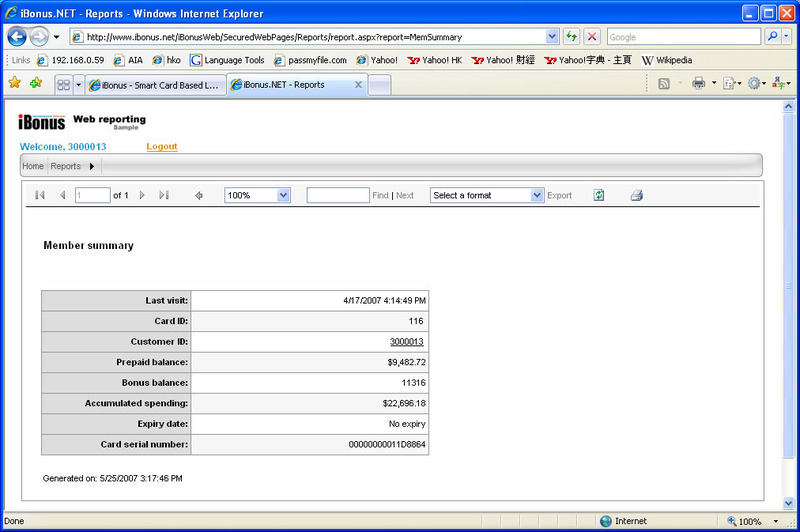 iBonus Administrative Tools -- Administrator can monitor the transactions sending back to server. Reporting functions are provided. Adminstrator can apply filters and grouping on member info, branch, terminal and transaction type. to make query on iBonus Database. 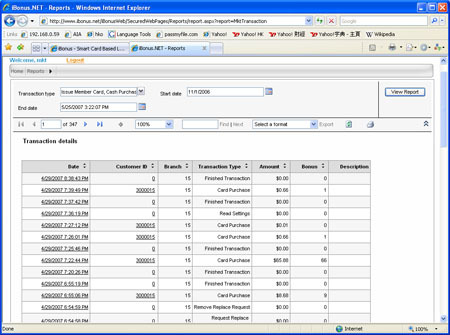 Adminstrator can find our at what time, what kind of customers make purchase the most frequently. 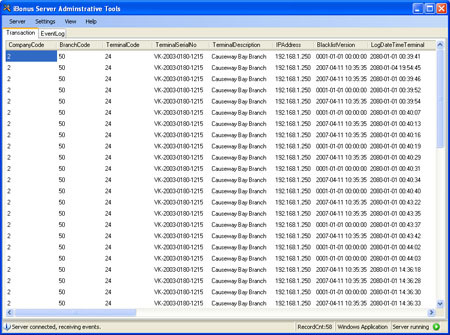 All result can be exported to Microsoft Excel .csv file for further analysis. 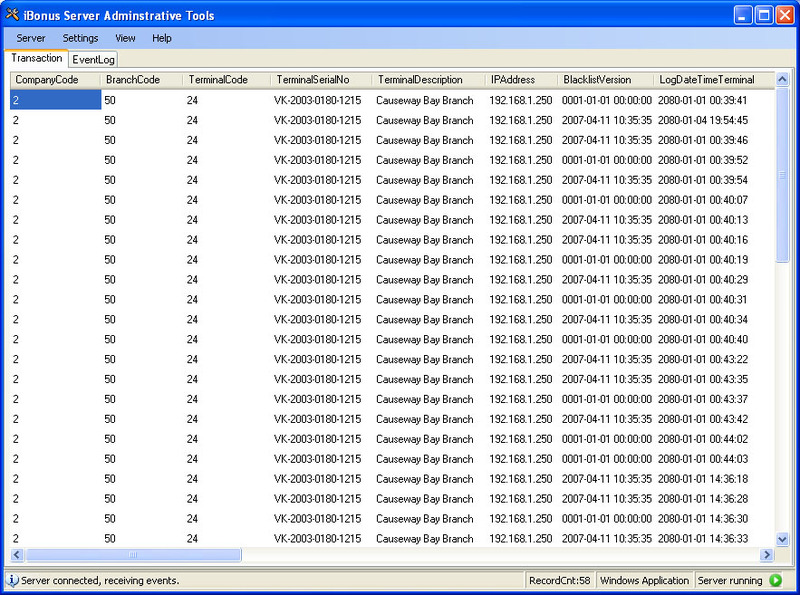 Report Application -- Administrator can monitor the Terminal Status. Report Application -- Administrator can apply filters on queries. 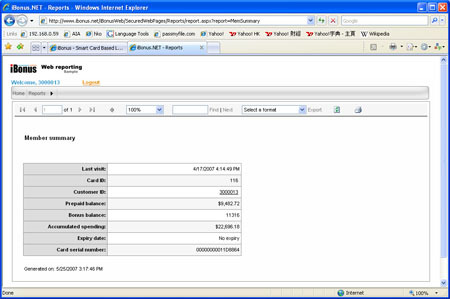 Written on Microsoft .NET technology, iBonus Server can be installed in any Windows PC and collects transaction records from multiple Terminals through computer network. Microsoft Access .MDB or Microsoft SQL Server 2005 can be selectively chosen for transaction storage. iBonus Server is part which manages the security of all advanced card control functions. It makes sure that every card renewal, repair and replace operation to be done securely among all distributed Terminals without compromising the system integrity. iBonus Server maintains a blacklist of the member card and staff card. iBonus Terminal download the blacklist periodically. Having a serial number match with an entry on the blacklist, the card is rejected at the Terminal. 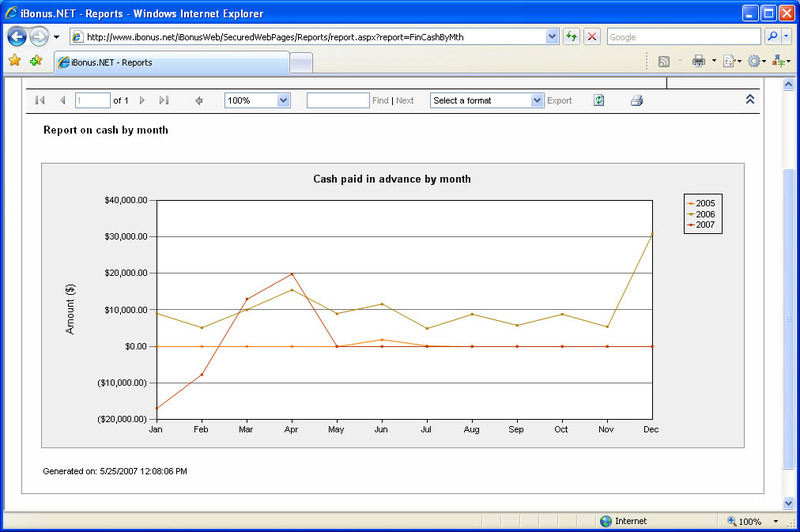 iBonus Reports (Sample Code) is distributed for free with iBonus Server Software CD. 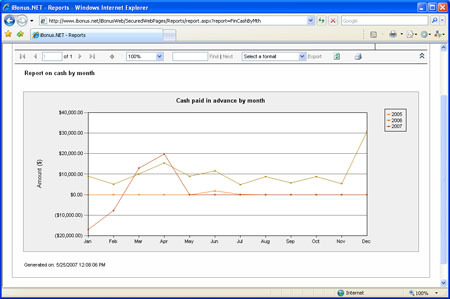 It is provided for system developer to get an idea how the data in iBonus System be used to provide web based reports. it leverages latest Microsoft ASP. 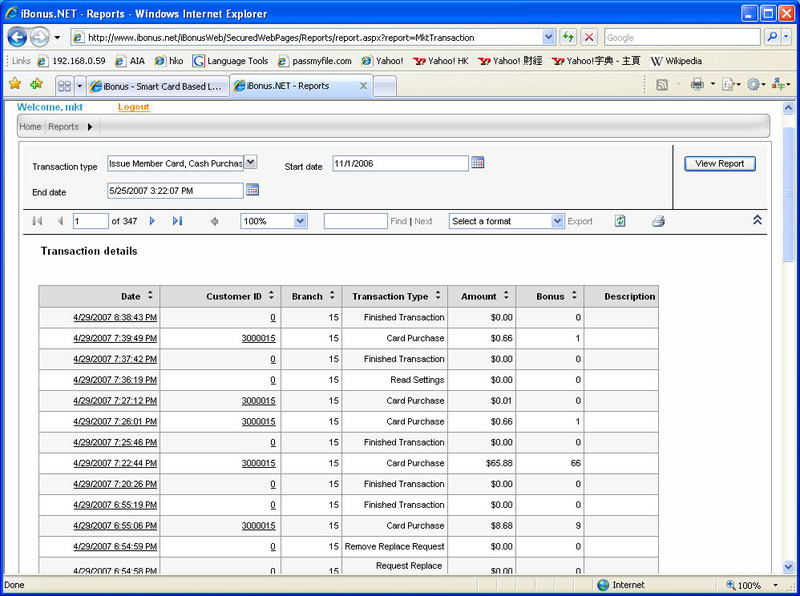 Net and Reporting Service Technology to offer web based reporting functionality. Role capability can be defined and let people with different responsibility see the most relevant reports tailored for them. iBonus Reports (Sample Code) is bundled with iBonus Server package. Microsoft SQL Server 2005 and Microsoft Reporting Services is required. If Microsoft SQL Server is not expected to be used in the iBonus System, the report application bundled with iBonus Server can be used for generating report without any further development. Expiry date and final card balance. 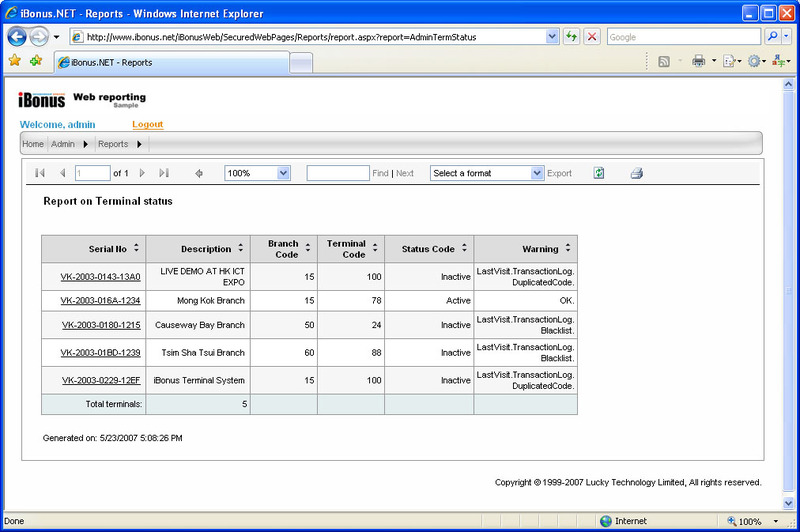 You can always create your own report by writing reports on Microsoft Reporting Services .rdl format. You can utilize all the charts and tables provided.